The Maryland Department of Natural Resources announced today that hunters harvested 86,542 deer during the combined archery, firearms and muzzleloader seasons, from Sept. 8, 2017, through Jan. 31, 2018. The harvest exceeded the 2016-2017 total by more than 1,000 deer. Included in the statewide total were 7,204 deer taken on Sundays. “Sunday hunting continues to be an important component in managing Maryland’s deer population,” Wildlife and Heritage Service Director Paul Peditto said. The 2017-2018 statewide harvest included: 30,247 antlered and 53,135 antlerless white-tailed deer; and 1,423 antlered and 1,737 antlerless sika deer. The harvest in deer management Region A (Western Maryland) increased 18 percent, from 8,490 deer last year to 10,003 this year. Hunters in these counties reported 6,237 antlered and 3,766 antlerless deer. Hunters in Region B (the remainder of the state) harvested 76,539 deer, nearly the same as last year’s harvest of 76,703. A total of 25,433 antlered and 51,106 antlerless deer were reported in this region. Frederick County led the harvest totals again this year with 7,354 deer, followed by Carroll County with 5,896 and Baltimore County at 5,559. Garrett and Montgomery counties rounded out the top five with 5,349 and 4,783 deer, respectively. 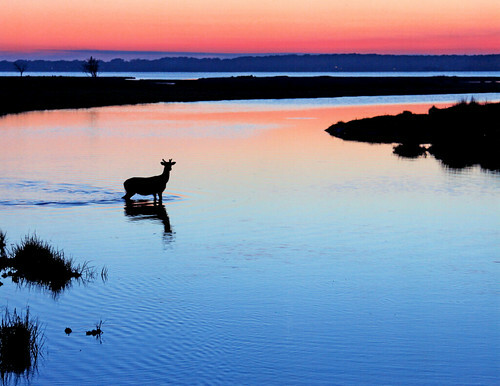 Several counties on the Eastern Shore, including Caroline, Dorchester and Talbot, saw declines that were likely related to an outbreak of Epizootic Hemorrhagic Disease. The virus is carried by biting midges and can spread quickly through localized deer populations. While deer numbers may be lower in these areas in the short term, the population is expected to rebound quickly in the coming years.